Add a funky element to your attire with this pair of black coloured Slip-On Shoes by Clarks. Let the sun go down for uncomfortable Slip-On Shoes, opt for this pair of Slip-On Shoes that is crafted using comfortable tpr sole. 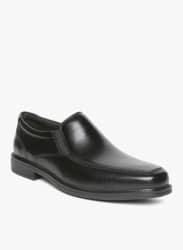 Featuring leather material upper, these trendy Slip-On Shoes will stylishly complement your crisp look when paired with trousers and a checkered shirt.